I love Pinterest. I mean, who wouldn't? If only it wasn't a lethal time-sink! I love looking at beautiful pictures and chatting with friends. Since Pinterest combines both it's like visiting a virtual art gallery with dozens of your best buds and getting to curate your own collection. I figured out a LONG time ago that I needed to limit my time on Pinterest if I wanted to get anything done. That's why I was surprised when I came across Daniel's article, Using Pinterest For Your Novel. It never occurred to me that The Great Timesink could be harnessed for good. Before I say anything more about using Pinterest to help organize your novel I'd like to talk about how to get a plug-in for your browser that will allow you to right-click on any picture you find on the web and pin it to one of your boards. I use Firefox so that's the browser I talk about, but I'd be surprised if similar plug-ins don't exist for your favorite browser. Pinterest Right-Click is the name of an add-on you can get that will help you collect images from the web and pin them to one of your boards. After you install the add-on all you have to do is right-click on an image. You'll be asked which board you'd like to pin it to and that's it! Quick and convenient. Pinterest provides and great way to visually organize your research for a novel. For instance, you could have one board for pictures of locations, one board for pictures of casting choices for your characters and one board dedicated to the music that not only inspired you as you write your novel but which your characters like to listen to. But that's just the beginning! You could have boards for what their homes look like, their wardrobes, landscape features such as gardens, where they like to go on vacation, what their families look like, what they dream about, and so on. Here's my Pinterest board for my NaNoWriMo novel: NaNoWriMo 2012. When I draft a story I tend to think visually. What a great idea to use a Pinterest board to hold miscellaneous images you come across on the web, images that remind you of various locations, or possible locations, in your novel. In my NaNoWriMo novel one of my characters, a mage, lives in an ice fortress (no, he's not superman!) and I have an image in my mind of what it looks like. I just Googled "ice fortress", found lots of great pictures that ... while none of them was exactly like the image I have in my mind, they're fairly close and evocative in their own way. Using Pinterest Right-Click I easily created a new board "NaNoWriMo 2012" and pinned those photos to my board. Although it changes, in the beginning I have certain ideas about what my characters look like. Though perhaps it's only partial. Perhaps I'll know that the antagonist has long thick black flowing hair that gleams in sunlight. It's fun to use Google images to help fill out the picture. I just went through and pinned a few images of how my characters could look and found out something valuable. Apart from Robyn, my protagonist, I'm not sure how the other characters look, especially her friend and side-kick Jane. Good to know! That's something I'll have to work on in the second draft. Music - What Would Your Characters Listen to? Since Pinterest is a visual medium the best we can do is pin pictures of albums, concerts, songs, magicians, and so on. Though it would be be great if we could pin the actual songs! Before this moment this isn't something I've thought about for my characters, what kind of music they'd like. It's good to think about, though. This helps bring out other aspects of their personality. At the moment all I know is that Robyn likes classical music. That might change, though, as I get to know her better. NaNoWriMo Update: Hurray! 45,025 words. Only one caffeinated writing jag away from the end. Not that I think that's going to happen, though it would be nice to finish tomorrow! Still, I think I'll continue to take it slow and steady so, if I keep my current pace, I'll be finished Monday. Which works out perfectly, since I wanted to be done before Jim Butcher's Cold Days comes out on the 27th. 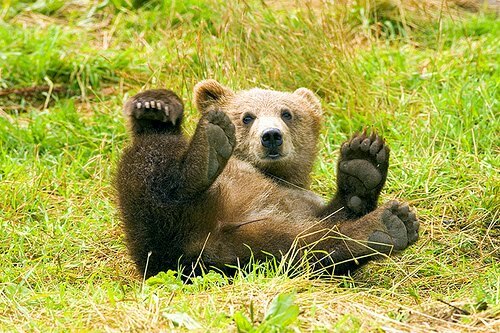 Photo credit: "Brown Bear having fun, rolling in the grass on his back with paws up" by Beverly & Pack under Creative Commons Attribution 2.0. Prior to this post, I had never even looked at Pinterest. It's a great name, great concept, and my sister had mentioned it, but I'd never taken a peak. Wordpress and Twitter seemed like more than enough. But Pinterest is amazing, and the many uses you pointed out really sparked my imagination. What an incredible supplement it would be to a novel if each character (or at least each appropriate character, so not the Bigfoot guy for example) had their own Pinterest, which owners of the book could access. 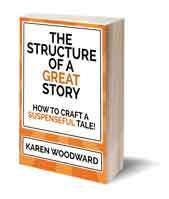 At the same time, non-owners of the book might come across a character's Pinterest and thus develop interest in checking out the novel itself. That's a lot of creative work...but it would definitely give a project a very cool multimedia angle. Thanks for the great post. "What an incredible supplement it would be to a novel if each character (or at least each appropriate character, so not the Bigfoot guy for example) had their own Pinterest, which owners of the book could access. 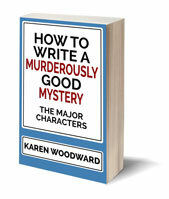 At the same time, non-owners of the book might come across a character's Pinterest and thus develop interest in checking out the novel itself." Wow! That is a terrific idea. I'd thought of perhaps creating a twitter account for my protagonist but I'd never thought about giving her a Pinterest account. Very cool. Thanks! Like mfawriterguy, I never thought of Pintrest as useful to my work, but once again, you've got me thinking.... thanks Karen! I think I will utilize PT as a place to illustrate "The Land of Deborah" as a concept as well as maybe for particular songs, ideas for album artwork etc. I personally love Pinterest and have started using it as my own visual inspiration for my WIPs. After reading some other writers' blogs, however, I'm starting to get a little nervous about the copyright issues surrounding using it. Have you come across anything conclusive in your research so far? "What You Should Know About Pinterest and Copyright"
Also, here is what Pinterest has to say about copyright and trademark. Here's what I'll say form my personal experience. Photographers/artists seem to liked it when their images are pinned even if the images aren't under a Creative Commons license. Why? I'm not sure. Perhaps it's because each pinned image is fully documented. It has the title of the piece, who created it, and a link back to its home on the web. For instance, many food bloggers don't like it when their images are re-purposed but I've yet to come across a blogger who doesn't like it when someone pins their photo. Backlinks mean more traffic and bloggers love traffic! Of course that doesn't mean that all photos are fair game. Here's my 2 cents, for what it's worth: as long as you're aware of the issues that can come up and you proceed intelligently and with sensitivity as to how the creator of the artwork would feel, pin away! Thanks for your comment. :) If that was clear as mud, let me know.